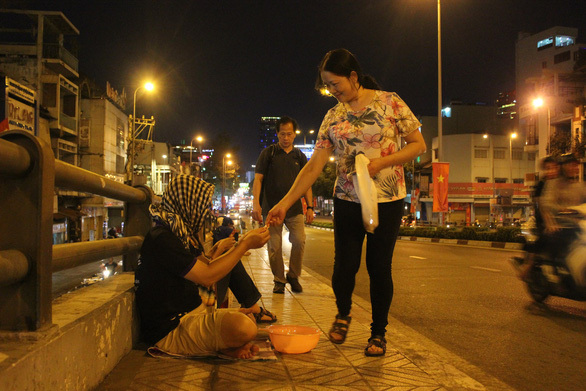 Two Vietnamese youngsters disguised themselves as beggars on the streets of Ho Chi Minh City on Lunar New Year’s Eve as a social experiment on people’s wholeheartedness and those who beg for money. One male and one female sat down on Ong Lanh Bridge connecting District 1 and District 4 in Ho Chi Minh City at 8:40 pm on Monday, the last day of the previous lunar year. While many beggars were sitting in the area, the two youngsters with their faces almost completely covered were not begging for money, but they were trying to understand people’s wholeheartedness and generosity during the most festive celebration in Vietnam. The Tay Ninh Red Cross volunteer and his orphaned female best friend sat on the cold tiled floor of the bridge, joining many beggars who were already there and starting what they called “a social experiment." Chau Thanh Toan, head of the SV07 volunteer group of the Tay Ninh Red Cross organization, is a well-known name to many volunteer groups and organizations in Ho Chi Minh City thanks to his activeness in helping the unfortunate. Accompanying him was his female best friend Phuong, who has lost both her parents and is interested in doing voluntary work to help others. While most people spent their last day of the lunar year with family preparing for the new year, the two disguised themselves as beggars on the Ong Lanh Bridge. The idea originated from when the two was wondering who usually begs, whether they are truly the ones in need and how much they would usually be given on special occasions. “Every day on my way to work, I see many people sitting here to beg,” Toan started explaining his intentions. When doing charitable work, most volunteers are youngsters who have to put lots of effort in raising funds to help those in need. Hence, it is important to help the disadvantaged rather than give away money to people who are merely lazy and do not want to work, Toan added. Many passers-by stopped at the bridge to give away money, gifts, and food as it was already the last day of the old lunar year. On this day, most families celebrate with a festive meal and the beginning of a new year usually includes giving each other lucky money in red envelopes. 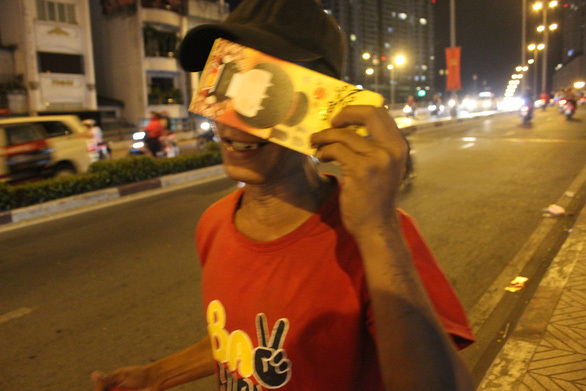 The amount of money given away by each passer-by as a way of wishing the beggars luck could reach up to VND100,000 (US$4.3), which is a considerable amount, especially for Vietnam’s working class. Every time a vehicle stopped, sets of gifts were donated to their children or other relatives. 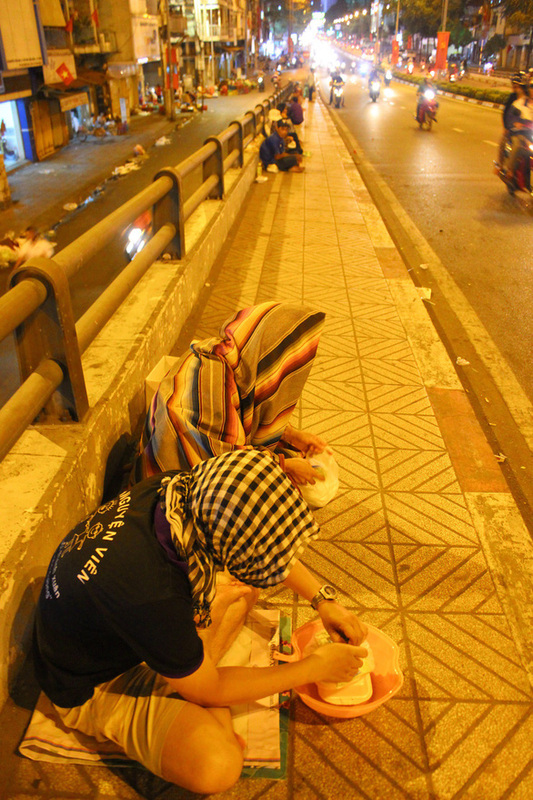 However, most begging on the Ong Lanh bridge are healthy people aged 30 to 45, who seemed to still be capable of working. “The previous years we decently and politely received the given gifts while only sitting on the streets [near the bridge],” a begging woman who received a gift from a generous passer-by said. “Recently other people have started gathering to fight for the gifts. Many [benefactors] even lost their phones to pickpockets. Benefactors thus do not come here as often as they used to,” she said, adding that a lot of kind-hearted people came by with gifts and lucky money envelopes on this day. Benefactors came from all walks of life, including families with kids, married couples, young dating couples, as well as single ones. “We sat until 11:30 pm last night and got seven steamed buns, two banh mi [Vietnamese sandwiches with meat], two rice boxes, two packages of milk, and VND240,000 [$10],” Toan said, adding that the gifts they received were later distributed to the people who were truly in need. 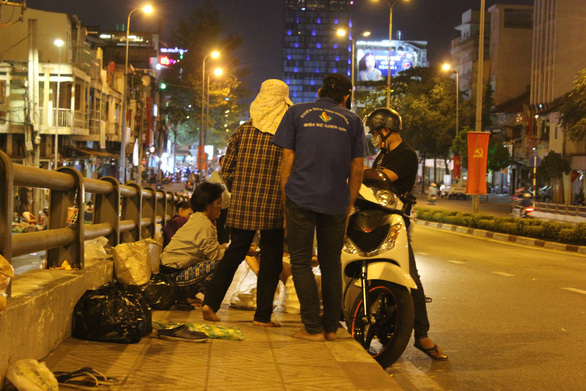 Most people who are beggars near the Ong Lanh Bridge are not those in need but are lazy and do not want to work for their livelihood, Toan came to a conclusion, mentioning that they are even heavy alcoholics. “Nowadays, generosity is being taken advantage of,” Toan warned. “There are many people capable of working but find it easier to beg for money, so they just come to sit on the streets to have enough to eat and bucks to spend.